addresses how innovative individuals and firms are using data to remain competitive while advancing their practices. seeks to address and rectify a gap in our learning, by explaining to architects, engineers, contractors and owners—and students of these fields—how to acquire and use data to make more informed decisions. documents how data-driven design is the new frontier of the convergence between BIM and architectural computational analyses and associated tools. is a book of adaptable strategies you and your organization can apply today to make the most of the data you have at your fingertips. Data-Driven Design and Construction was written to help design practitioners and their project teams make better use of BIM, and leverage data throughout the building lifecycle. 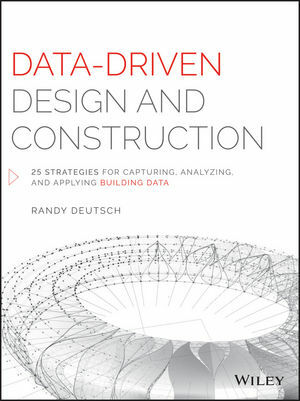 Randy Deutsch, AIA, LEED AP is an Associate Professor at the University of Illinois, a BIM authority and architect responsible for the design of over 100 large, complex sustainable projects. A recipient of the AIA Young Architect Award-Chicago, Randy is recognized as a professional thought and practice leader, TEDx and keynote speaker, and author of BIM and Integrated Design: Strategies for Architectural Practice (Wiley, 2011). He is a frequent contributor to DesignIntelligence and leads a Harvard Graduate School of Design Executive Education program at Harvard University. Randy consults and presents internationally.